The days before releasing a new Skinpack are always very busy, I'm always scared of forgetting something or missing some bugsand this makes me really nervous. I beleive that now is time to release the new update of my S100 Skinpack that contain the new features I wrote about in my previous post and some bugs fixed that have been reported me by some users. NOTE: All the skipack versions from for firmwares from 1.6.9 contain the same Skinmanager\Skintool functions and features but the packs for the newest firmwares (1.8.9-1.9.9) are the ones that surely contain all the new skin mods and fixes. This doesn't mean that the pack for fw 1.7.9 is not good but just that maybe i missed something in the older fw versions because i cannot test all the skins for all the firmwares each time i make an update and in the same time i cannot ensure compatibility with all models for the older firmwares. So to be sure that everything work fine, please update your firmware if you can. Once the payment is confirmed you will be redirected to the Skinpacks folder (click on "return to seller site") where you can find older versions, the curent one and even the new ones when they will be available. You will also receive an email with a memo of the folder link. The people who already paid the previous version DON'T have to pay again! Just look in my dropbox folder. THIS SKINPACK DOESN NOT INCLUDE THE CARPLAY SKIN!! I'll send also a copy of the link by email but if you have problems of any kind, feel free to contact me by email. Where have you seen that? will CarPlay be available for 1.8.9 or only for 1.9.9 ? Do you maybe have a link, where I can download 1.9.9 without speaken russia like on 4pna ? Carplay will be surely available for 1.7.9, 1.8.9 and 1.9.9. There are no differences in the ui between 1.8.9 and 1.9.9, so you don't need to update. Also these last 2 firmwares have the audio player buggy. here is your dropbox folder? If you buy the skinpack you'll have the link. If you already buyed it you have received an email with the link. Ma dove trovo il firmware 1.9.9.0 ? E' uscito solo per pochi modelli, e cmq non cambia quasi nulla. Il player audio è ancora buggato. Poi te lo passo dal forum kia. Ma non ce un equalizzatore per wince? Hi Kotix, I have firmware 1.7.9.0 and tried to install the skinpack for it. When I set the navigator to Skin Manager and press the Navi button, the interface freezes and I have to restart the device. Do you know what might cause this? Did you try the older version too? Does it the same? Did you extract the pack in the root of SD as it is not in other subfolders? Hello, I bought your package and I'm having doubts for the update. My biggest goal is to be able to change the default audio player that plays songs originally not in folders. Please tell me what should I follow tutorial to include the modification on my device. It is a Winca S100 Android 4.0.3 for Hyundai HB20. I do not know how to see the firmware version, not even in her settings. Please show me the tutorial that I follow! 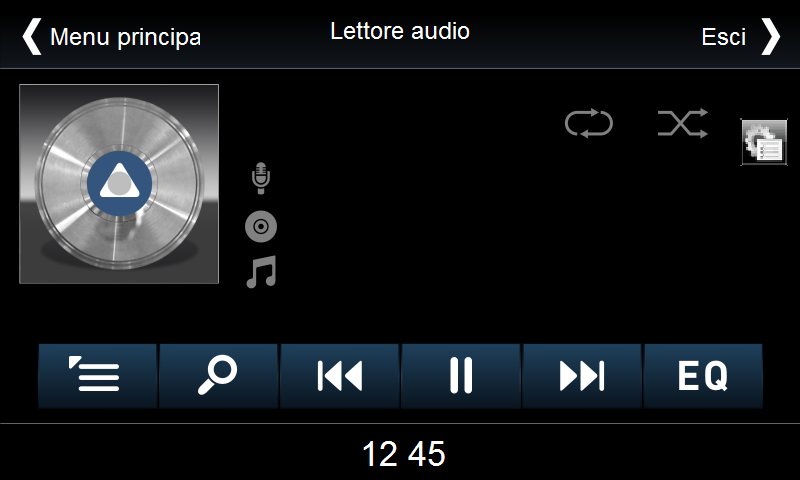 I do not care to change the skins or not, what I want is just to change the default audio player. Hi KoTiX, I've been looking at your work here for winca s100 and I have to say that it looks just great. I recently switch to WinCE 6.0 on my s150 because of the known annoying Android 4.0 issues. I'm interesting in purchasing your skin pack, but I also want to know how to get updates when they're ready to pick up. I guess I have to purchase it only once, and then I'll get the upcoming updates, Am I right? If so, how to get them? Looking forward to your reply. Thank you. You are right. Buying the skinpack you will have access to my download folder where you will find actual skinpack and future updates. This folder will not included the carplay skin that will be sold separately and will be in a different folder. How much will the carplay skinpack be? I still have to decide the exact amound but i'm thinking to sell carplay for around 20 euros, but for the people who already buyed the other skinpack will be disocunted to 10 euro. Today I upgraded my S100 C230 to 1.7.9 update. I think I am successful but not sure about all features. The skin was changed and that was unexpected for me and I really hate it. Is there any way to go back to old skin? Is there there any option to get freeware old skins from you? Why dont developers put tv icon on main menu, and also favorite at least five radio channels can be attached to the main radio screen. Have a good time and I really like your work. I hope I can make donation on time. What do you mean by "old skin"? The new firmware installed you a new skin? or are you using my skinpack? Chinese developers have their way to see the user interface, i aqree with you that many things could be improved very easily, but they are more concentrated on releasing more models to gain more money (IMO). Well my skins can probably fix it reinstalling the default skin, but only if you didn't extract all the firmware folders correctly. Can you see the chinese characters in the files and folders of the firmware? Did you try to reflash it? During the installation the screen was black out and I turned the key off and on again. But Installation completed after then. I am not sure if I should re install the firmware... One more thing; I downloaded opera10 for wince6.0 and renamed as opera mini and add it on the firmware folder. Now radio is ok, Bluetooth is ok, Navigation is ok, Tv is ok, Back Camera is ok...I didnt checked Dvd, Virtual Cd, Usb Media Player. There is a calculator app and also additional games app... Also there is tools menu without setting functions that it has used to... No wheel remote functions, no EQ, No Language, No light color change, No icon change, No Apn settings ... Totally no customization... I also checked opera 10 is working but I cant setup wifi connection... Yes I can see chinese characters in the firmware files... Should I reinstall it again? At some point of the flash of the firmware the screen goes black for 30 seconds, this is absolutely normal, you shouldn't touch anything at that point, just wait the end of the process. Reflash the firmware and see if it change something..
Today I installed again but this time I added Zetakey browser instead of opera everything looks ok except the skin... Thanks for your help Kotix. this Skinpack update available (04.02.2015) includes demo of carplay ? Hi Kotix, I have a problem with the Nitrogen player... The problem is that the player not show the right time for some mp3 songs, shows more than have . Do you know if someone has more happened or whether any error of the player ? Thanks and congratulations for your work. Hola Marco. Compré el fullpack (€ 30) para mi S100 con firmware 1.9.9.0. Mi vehículo es Nissan Qashqai 2015. No soy muy bueno es ésto. Entonces, le pregunto si Ud tienes un tutorial "paso a paso" para apoyarme e instalarlo sin errores. Muchas gracias. Abelardo Guadarrama. Para enstalar el skinmanager y los skins tiene que decomprimir el archivo rar en el raiz de la SD ( pulsa doble sobre el rar, seleciona la tarjeta SD y pulsa ok). Asì que tiene la carpeta "Skinmanager" en el raiz de la sd. En tu radio pone en las impostaciones la ruta para el software GPS asì: "\Skinmanager\Skinmanager.exe"
Pulsa el boton "NAVI" y skinmanager empieza. Hi, my skinpacks are not free. Ciao, ho appena acquistato 2 due skins per venti euro, operazione conclusa con paypal.